The Surface Pro tablet with Windows 8 from Microsoft has only half of the battery life of the less expensive Surface with Windows RT, and less than the average battery life of Ultrabooks too. Microsoft announced on Thursday that pricing of the Surface Pro will start at $899 for the 64 GB storage model and $999 for the 128 GB version, which includes a digitizer pen, although not a keyboard cover. The tablet is scheduled to go on sale in January, but Microsoft did not give an exact date. The Surface with Windows RT (starting at $499 for 32GB model) and the forthcoming Surface with Windows 8 Pro have several other key differences. The Windows 8 Pro Surface is thicker and heavier, and runs on an Intel Core i5 processor with 4GB of RAM. It also has a higher-resolution 10.6-inch screen at 1920 by 1080 pixels. The Intel chip is needed because the Surface Pro can run regular Windows software in Desktop mode, such as Photoshop or Firefox. 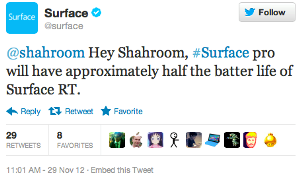 The Surface RT is limited to Microsoft Office in Desktop mode and Windows Store apps. That power-hungry processor provides another difference between the two tablets, which Microsoft revealed via its Twitter account.The better-equipped Surface Pro has only half the battery life of its sibling—meaning you would get around four and a half hours on a charge at most. This is despite the fact that the Windows 8 Pro Surface keeps connectivity off when hibernating to preserve battery, so it’s not an always-connected tablet. Considered as a tablet, the Surface Pro costs more than a high-end tablet, and has half the battery life. Perhaps it's better to compare it with ultrabooks, which are more in the price and power range. But even in this case the Surface Pro falls a bit short of its rivals. In PCWorld’s tests, ultrabooks from Vizio, Asus, Acer and Dell have consistently passed five hours of battery life, with some going toward a six-hour average—around an hour more than the Surface Pro.